On November 3, 1979, five protest marchers in Greensboro, North Carolina, were shot and killed by the Ku Klux Klan and the American Nazi Party. There were no police present, but television crews captured the shootings on video. Despite two criminal trials, none of the killers ever served time for their crimes, exposing what many believed to be the inadequacy of judicial, political, and economic systems in the United States. 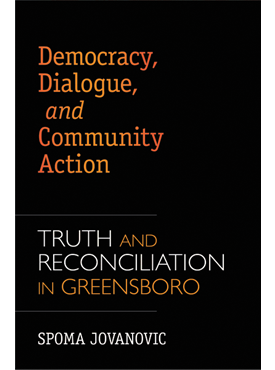 Twenty-five years later, in 2004, Greensboro residents, inspired by post-apartheid South Africa, initiated a Truth and Reconciliation Commission (TRC) to take public testimony and examine the causes, sequence of events, and consequences of the massacre. The TRC was to be a process and a tool by which citizens could feel confident about the truth of the city’s history in order to reconcile divergent understandings of past and current city values, and it became the foundation for the first Truth and Reconciliation Commission in the United States. Spoma Jovanovic, who worked alongside other community members to document the grassroots effort to convene the first TRC in the United States, provides a resource and case study of how citizens in one community used their TRC as a way to understand the past and conceive the future. This book preserves the historical significance of a people’s effort to seek truth and work for reconciliation, shows a variety of discourse models for other communities to use in seeking to redress past harms, and demonstrates the power of community action to promote participatory democracy. Spoma Jovanovic is associate professor of communication studies at the University of North Carolina at Greensboro. • Winner of the Jane Jacobs Urban Communication Book Award from the Urban Communication Foundation, which recognizes an outstanding monograph that exhibits excellence in addressing issues of urban communication. • Winner of Sue DeWine Distinguished Scholarly Book Award. • Winner of the Top Book Award for Case Studies in Communications Ethics from the Communication Ethics Division of the National Communication Association.